Your code cannot be compiled as C++ code. You’ll have to follow ‘C’ rules, a local variable declaration must appear before any statements in a function body. 1>fpdfsdk\src\fpdfsdkdll.rc(10): fatal error RC1015: cannot open include file ‘afxres.h’. This header is a part of the MFC Library. VS Express edition doesn’t contain MFC. If your project doesn’t use MFC you can safely replace afxres.h with windows.h in your fpdfsdkdll.rc. after the change, successfully compile it. 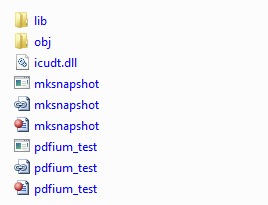 2 Responses to "Building PDFium with Microsoft Visual C++ 2010 Express"